You simply must give this a whirl. You'll be delighted you did. Promise. 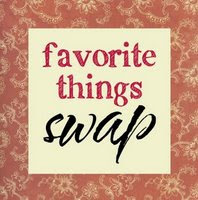 Kelly is hosting her fabulous swap again. I had such a blast last year, I can't wait to participate again this year. It's a great way to meet other bloggers and share a few of your favorite things. Pop on over to read about all the particulars and of course, sign up. Hurry though, sign ups end Friday, June 6th. In the words of Gwen Stefani, what you waiting for? Go. Go now. Found your blog through Rocks in My Dryer. Glad I stopped by! Holly, I signed up yesterday and can't wait. It should be so much fun! I need to start collecting my favorites soon.